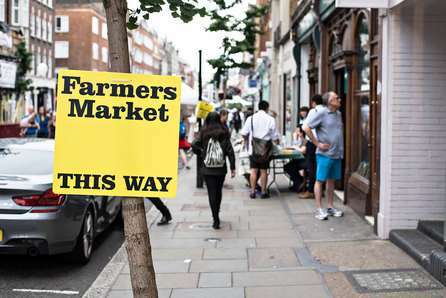 The pronunciation of the name of this area divides even life-long resident Londoners. 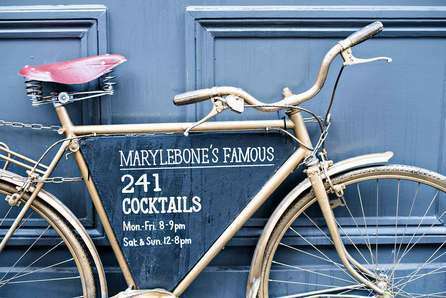 Whether you call it ‘Marry-leh-bon’ or ‘Marly-bone’, this neighbourhood is undoubtedly one of the most exclusive addresses in the city. The pronunciation of the name of this area divides even life-long resident Londoners. Whether you call it ‘Marry-leh-bon’ or ‘Marly-bone’, this neighbourhood is undoubtedly one of the most exclusive addresses in the city. 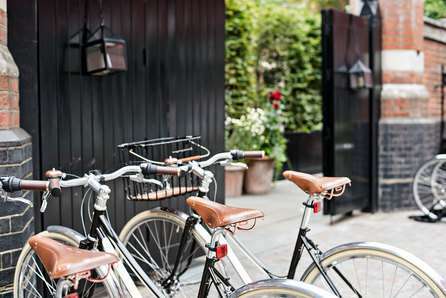 Focused on a high street that stretches from Marylebone Road in the north down to Oxford Street in the south, the area has a number of major north-south routes running through it, as well as small clusters of neatly-kept mews between them. Alongside one of its most famous streets – Harley Street, a globally renowned centre for medical care – Marylebone is currently a high-end shopping destination, renowned for its designer boutiques and luxury homewares stores. 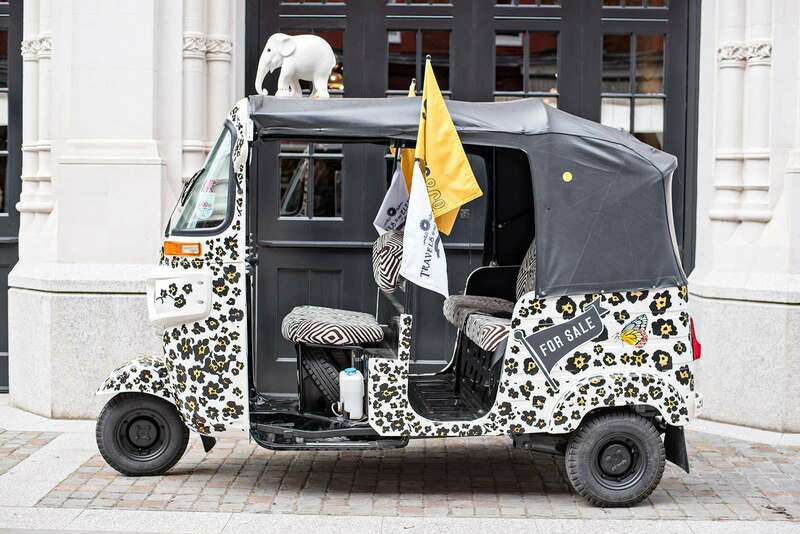 The area also boasts a number of exclusive bars and restaurants, including the current celebrity-favourite, the Chiltern Firehouse. 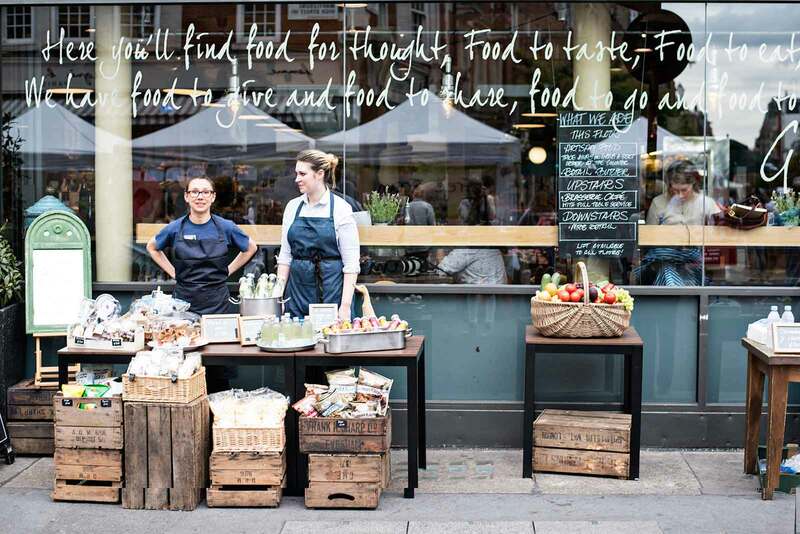 Marylebone’s fitness and wellbeing offering is much like the local shops, upmarket and independent, ranging from yoga and personal training, to boutique meet-ups and the area’s royal parks. 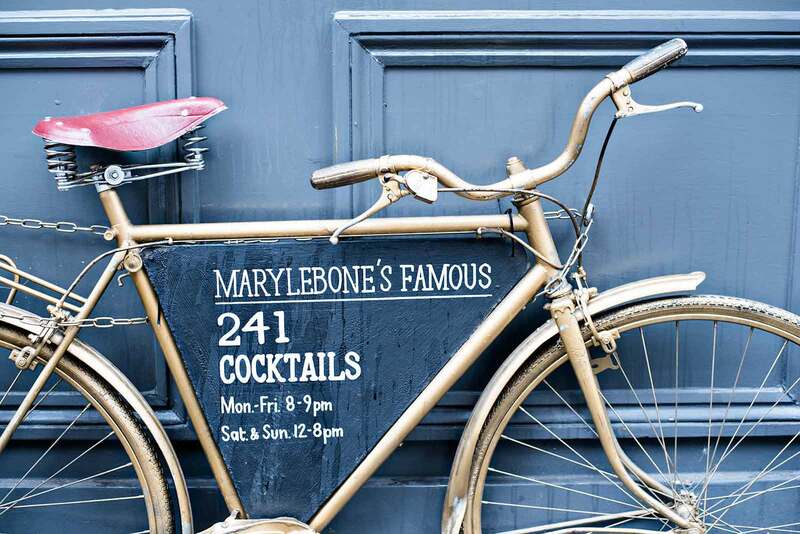 Made famous for being the fictional home of detective Sherlock Holmes, Marylebone has a rich cultural past. Located between Hyde Park and Regent’s Park, it has become one of London’s most fashionable and upmarket districts with an excellent choice of independent shops. 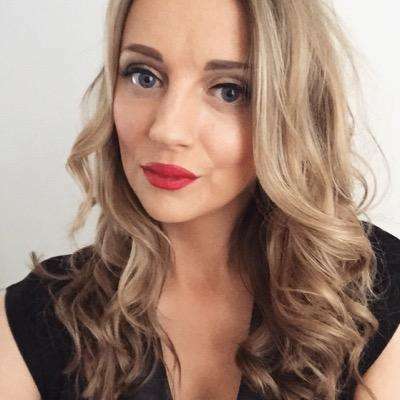 The same can be said for the fitness and wellbeing offering, with a wealth of upmarket and unique choices available from yoga and personal training, to boutique meet-ups. Pilates exercises stretch, strengthen and balance the body, enabling you to move with economy, grace, make the most of your strengths, counteract any weaknesses, and correct any imbalances. bePilates offer fun workouts with variety; you can choose between small-group mat, reformer and tower classes. 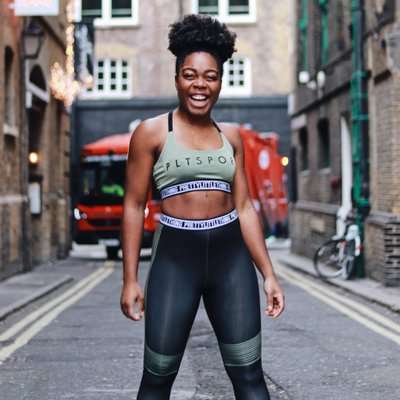 Nestled between London’s Harley Street district and Marylebone Village sits Club 51 London, the flagship premium brand Personal Training studios. 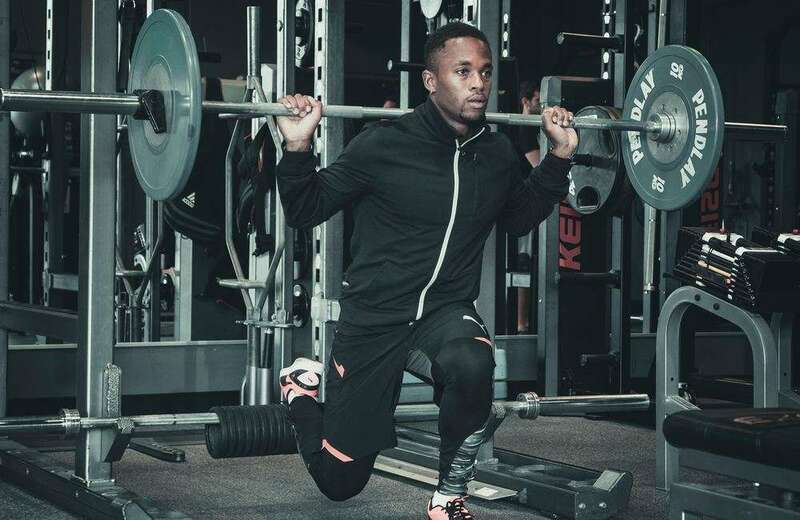 Designed to offer a unique approach to health, fitness and rehabilitation, these private studios offer a calm, relaxed and natural training space for bespoke 1-to-1 coaching. Entrance is strictly by appointment only though but you’ll be in the hands of health and fitness specialists are used to working with elite clients. Indaba means ‘gathering’ and they truly have gathered London’s most talented teachers to create the ultimate yoga studio. Spread over four floors, offering classes everyday of the week in a plethora of styles and for all levels from beginners up to professional yoga teachers. Book yourself in for a private session or Thai massage and you get to check out the Skyview studio which has an innate feeling of tranquility with wonderful views overlooking Marylebone. Just a 2 minute walk away from Marylebone train station you’ll find LA Fitness Marylebone. You can hit the gym or one of their exercise classes including circuits, step or BodyAttack. You can relax in the sauna or steam room. Or you swim away the stresses of the day in one of their premium swimming pools. 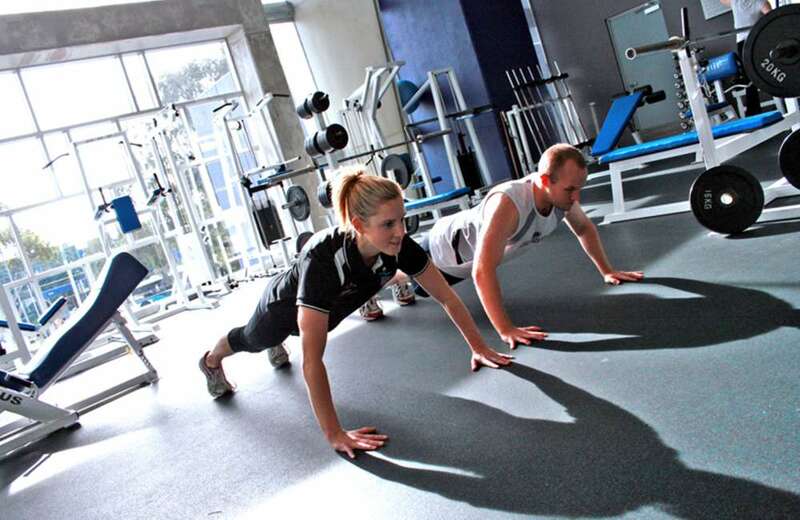 The centre also offer Personal Training sessions so you can get a workout tailored to your needs. 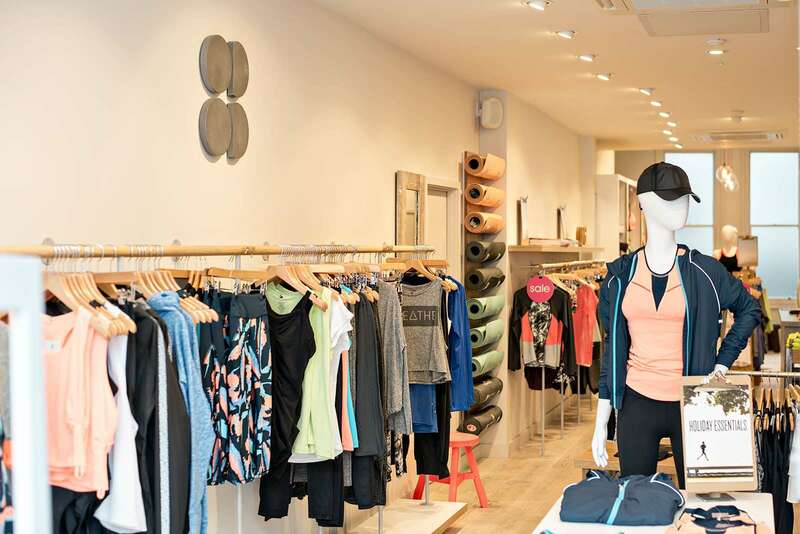 Being a fashion forward fitness clothing store first and foremost is the job of this intimate boutique space. But they also play host to a number of fitness clubs including workouts, yoga dance and run club throughout the week and at weekends. Check out their website to see the latest offerings and also book online. You can even purchase exclusive club apparel like a “I’m just here for the savasana” tank. 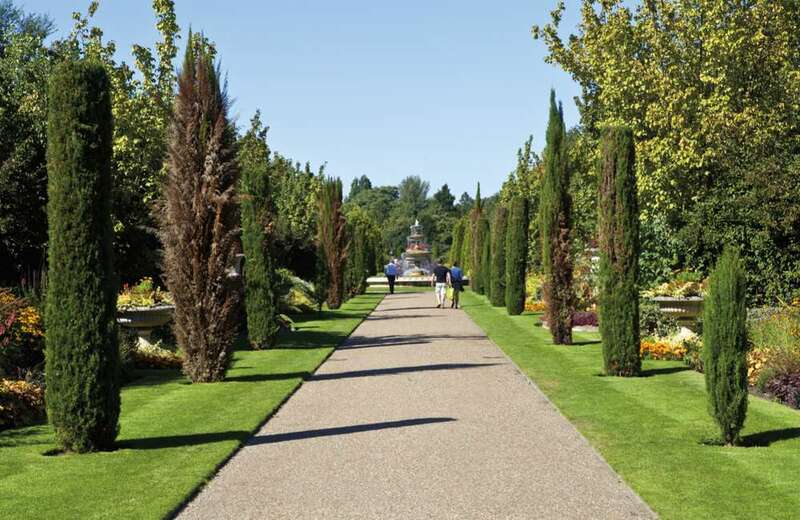 The Regent’s Park covers 395 acres in the centre of London. With excellent sports facilities spanning nearly 100 acres it includes the largest outdoor sports area in central London – The Hub. The Hub offers a variety of exercise classes and has sports pitches for hire, with changing rooms and showers. Or take a trip on the water at the boating lake which is open daily April through to September offering rowing boats and adult pedalos for hire. 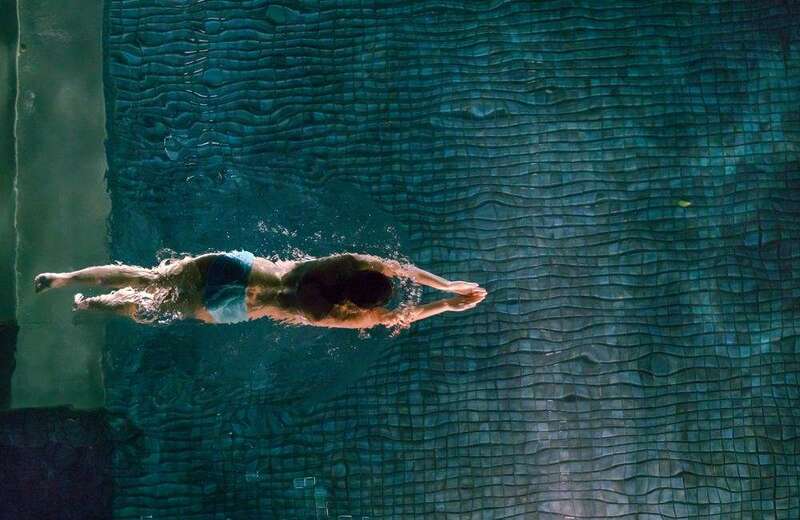 Located close to Marylebone, Seymour Leisure Centre offers fantastic facilities include a 100 station Gym, 30m Swimming Pool, Climbing Wall, Group Exercise Classes, Sports Hall, Spa and Beauty Salon. You can also join the Serpentine Run Club who meet Seymour every Wednesday evening and Saturday morning for runs taking in the sights of London round the great parks. 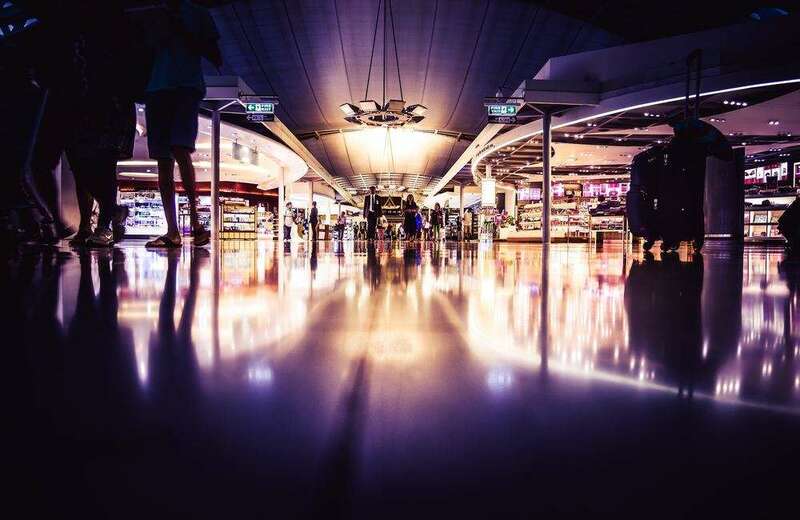 Appealing to a large number of city workers, you’ll find everything from fashion and beauty for women and men, to chocolate shops and food stores. 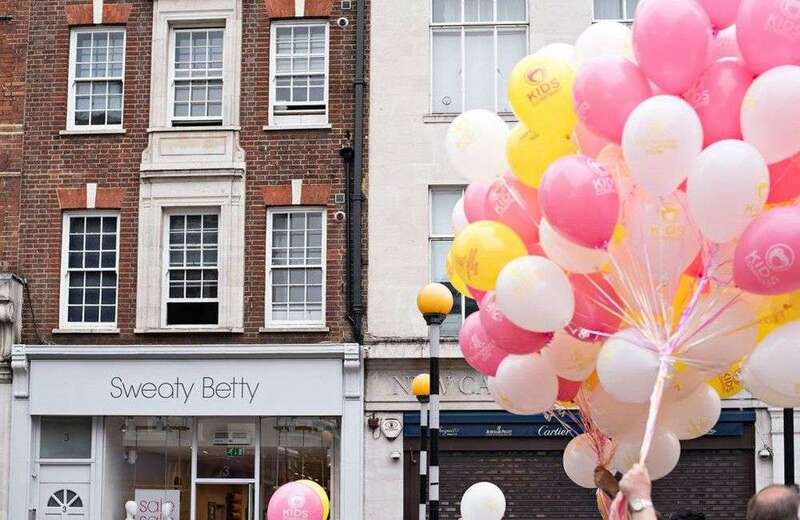 Marylebone is a beautiful area of London when it comes to shopping. The quiet streets make for a stress-free day out while the shops themselves offer something slightly different. Choices include; luxury and high-street fashion stores, homeware shops and a selection of childrenswear boutiques. 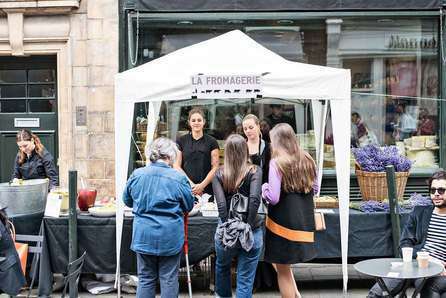 In amongst the high-end stores is a selection of cafés, patisseries and restaurants to make your shopping day even more enjoyable. 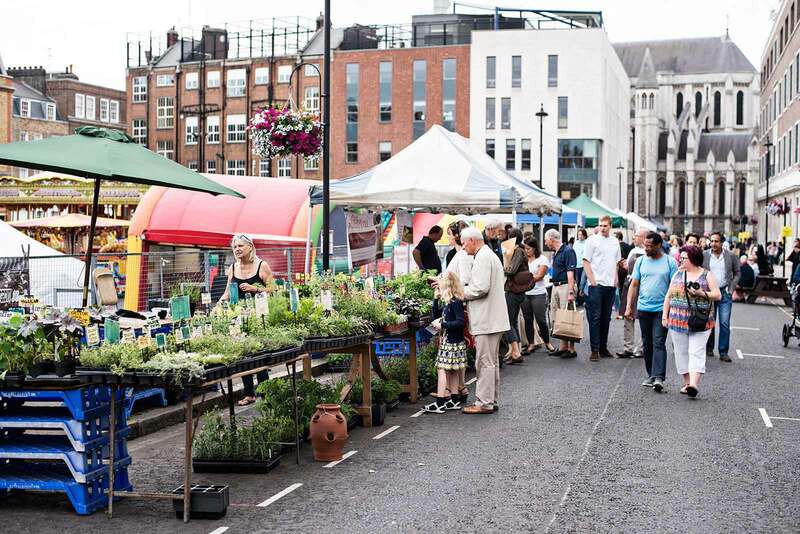 On weekends, there’s a food market and various clothing stalls in the Cabbages & Frock market, at St Marylebone Parish Church. 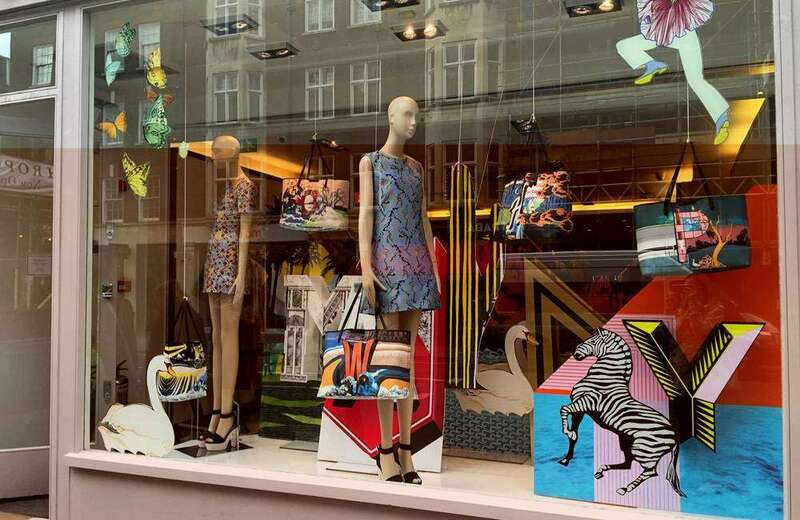 Aspinal of London’s colourful frontage and bright coloured window displays – full of the brand’s beautiful handbags – draw you into the store. Inside is an array of British heritage handbags, including shoulder and crossover bags, in addition to clutches and wallets. For the gents there are briefcases and accessories such as leather wallets and sterling silver cufflinks. 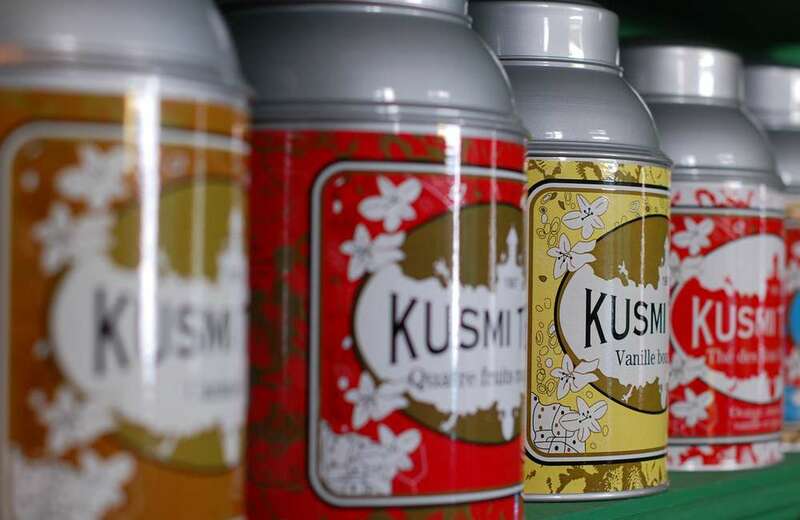 Kusmi Tea is a Parisian tea brand that has brought a spot of Paris to London. The prestigious tea brand creates blends of black and green tea infusions, all presented in colourful tins. Try the BB Detox, a tea designed as a beauty detox with green tea, mate, rooibos, guarana, and dandelion, flavoured with grapefruit. 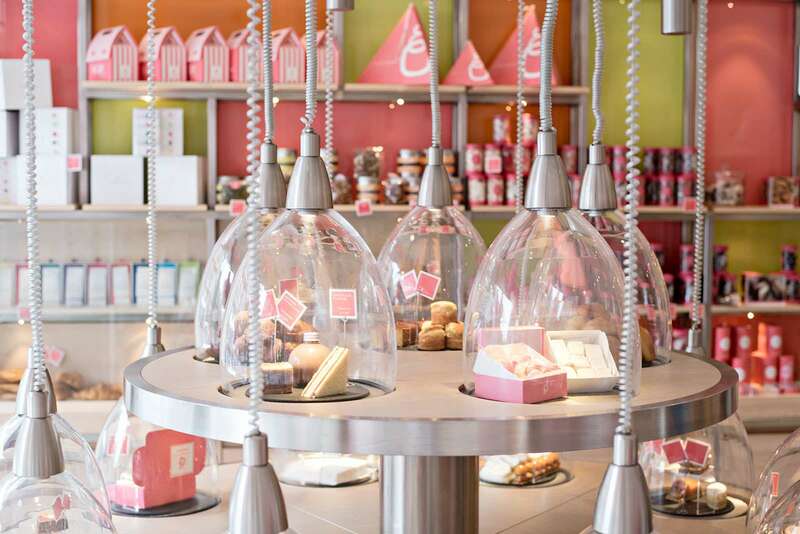 Enjoy a tea and a delicious patisserie selection of cakes at the in-store café. The popular online designer boutique brings luxury fashion to their very own boutique store in Marylebone High Street. 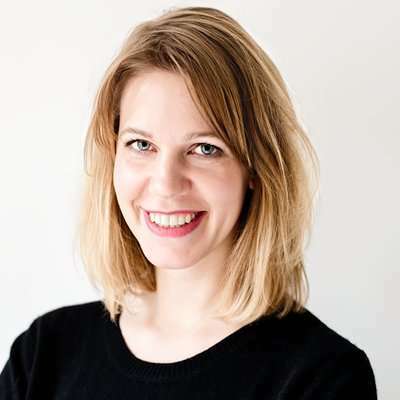 Expect to find women’s and menswear from top fashion designers; Alexander McQueen, Stella McCartney, Mary Katrantzou to emerging designer fashions. With over 400 designers to choose from, you’re guaranteed to find something to your taste. 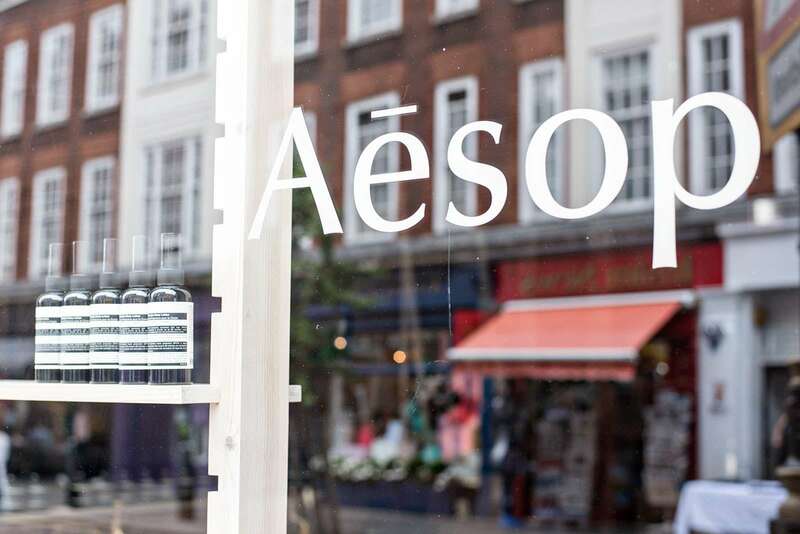 The Aesop store on Marylebone High Street offers a stripped back store that celebrates the urban history and bones of the original building, with brick walls and wooden shelves that really put focus on the products. The Aesop brand was established in Melbourne in 1987 and the range is a mixture of natural skincare, haircare and body care, as well as fragrances and gifts. 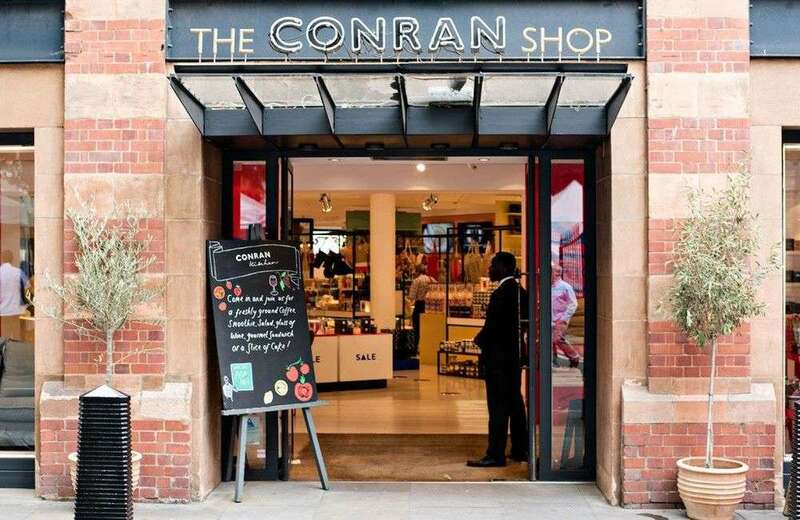 The Conran Shop in Marylebone has over three floors of contemporary furnishings, one of a kind vintage furniture pieces and everything else in between that you could need for the home. 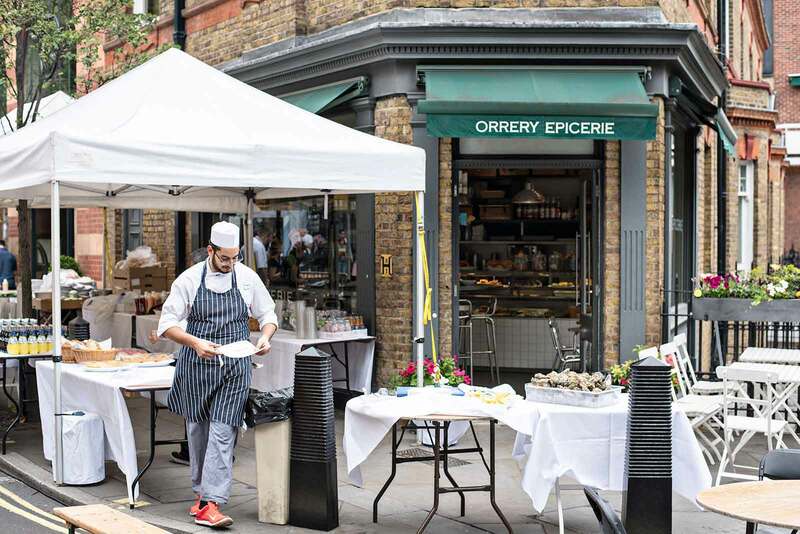 Above the concept store is The Orrery restaurant, while the top floor houses the penthouse apartment home of The Conran Kitchen, the perfect place to stop for a fresh sandwich and coffee. Marylebone has a wide range of must-see places waiting to be discovered, many of which often house a treasure trove of unique stories and experiences. 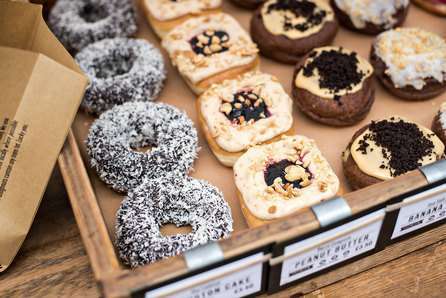 Explore some of our top recommendations below and get the insiders’ take on Marylebone’s hidden gems. 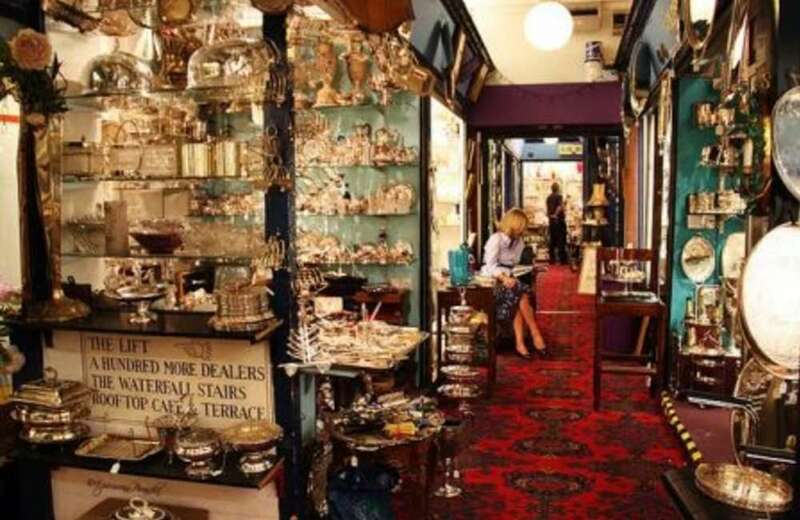 Up above the busy Marylebone Road, Alfie’s Antiques Market is a paradise for vintage collectors. The market is housed inside a former department store, and following an extension back in the late 1980s, now contains more than 75 small shops. Dealers stock furniture, jewellery and vintage clothes, art and ephemera. Once you’ve shopped to your heart’s content you can head up to the Rooftop Kitchen for a restorative afternoon tea, overlooking the roofs of central London. 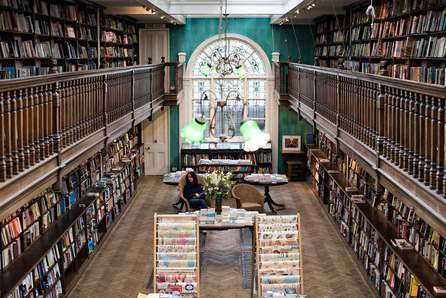 Not particularly well hidden but unmistakably a gem, you can find Daunt Books on Marylebone High Street. 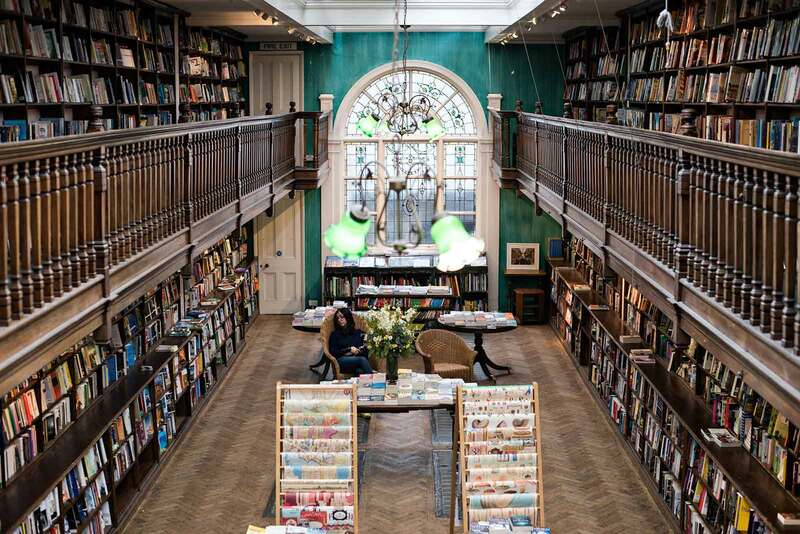 Daunt Books resides within an original Edwardian bookshop that was reported to be the first purpose-built bookshop in the world. 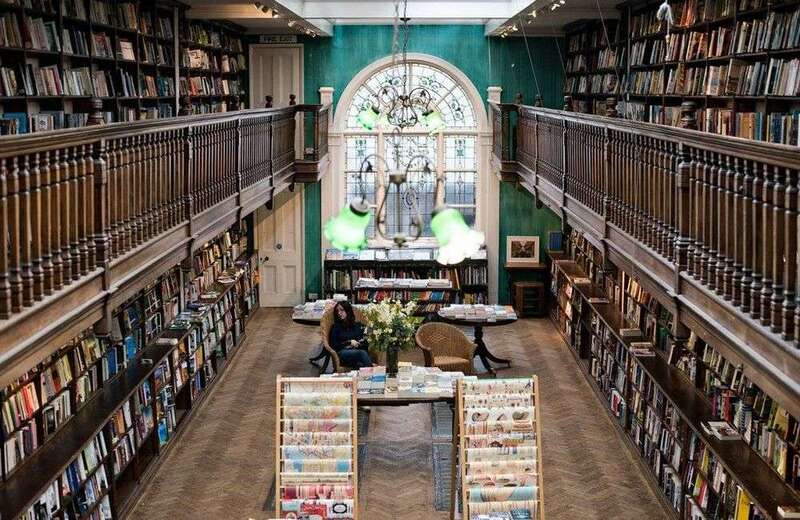 Its shelves are stocked with a well-selected collection of literature for both adults and children, with a particularly fine gallery filled with travel books that will have you reaching for your passport. 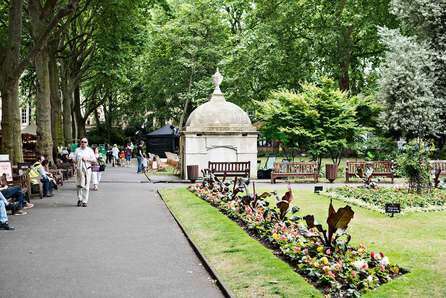 Split in two by Paddington Street, the Paddington Street Gardens were designed as former burial grounds for the old St Marylebone Parish Church. 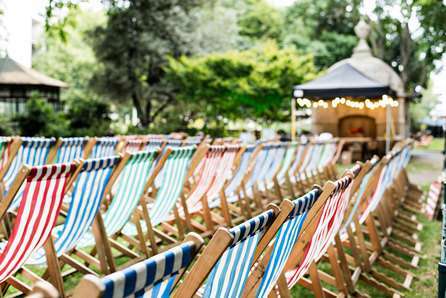 Today however most of the gravestones have been removed, and the gardens are tree-filled spaces for recreation, containing a children’s playground, benches and footpaths, and occasionally hosting open air concerts during the summer. To call VV Rouleaux a fancy ribbon shop is to do this unique shop a huge disservice. 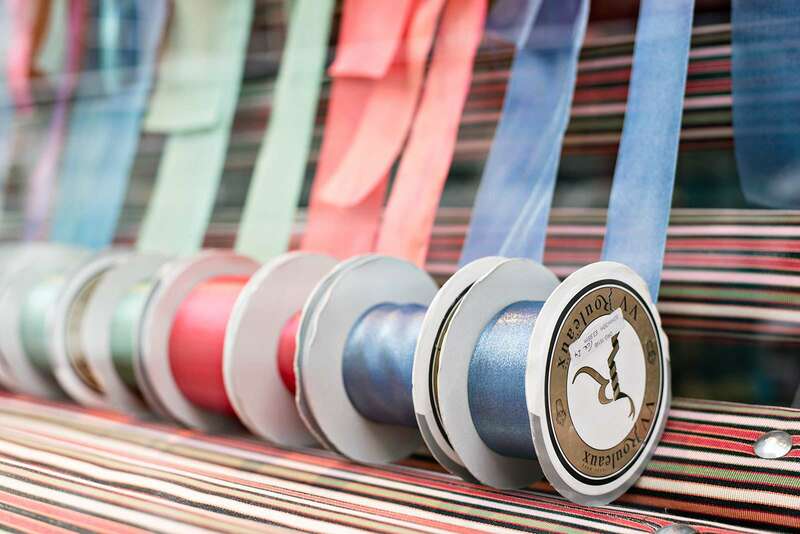 You may find yourself enticed inside VV Rouleaux, by its multicoloured windows filled with fabulous haberdashery. Inside are yards of every kind of trimming you could possibly imagine, and helpful sales staff who can advise you how to make your own hat or help you pick out the perfect Grosgrain to wrap a truly fabulous parcel. A fine example of a Gothic church, St James, Spanish Place, is a Roman Catholic church, which despite its name is confusingly located on George Street. (The ‘Spanish Place’ in the church’s name refers to a previous incarnation as the chapel attached to the nearby Spanish Embassy.) 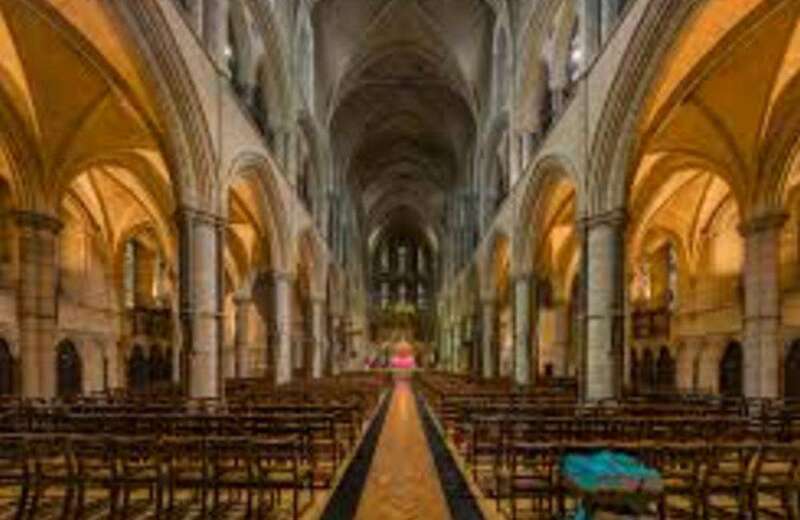 The front of the church is a copy of Lichfield Cathedral in Staffordshire, whilst the ornate interior echoes details from Salisbury Cathedral and Westminster Abbey. The dining scene in Marylebone is one of London’s finest with extraordinary restaurants featuring different cuisines from Peruvian and French to Greek and Italian. 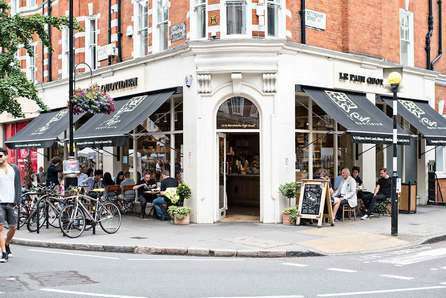 Marylebone is an affluent residential neighbourhood in central London, surrounded by Oxford Street on the south side and Regent’s Park on the north side. 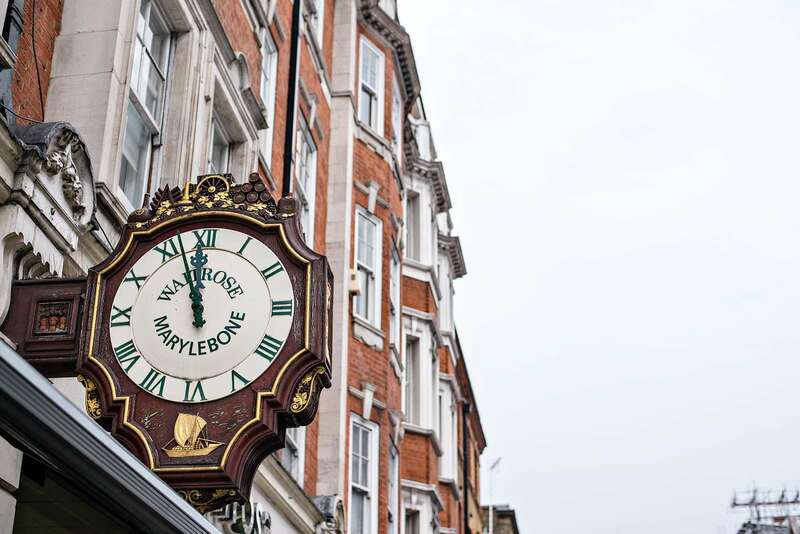 Marylebone has been an incredibly fashionable area in London since at least the seventeenth century and nowadays is still the place to go for high-end boutiques, fine art galleries and specialist shops. 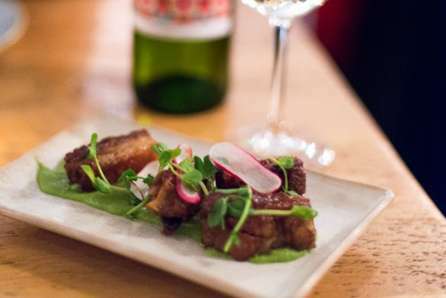 The dining scene in Marylebone is one of London’s finest with extraordinary restaurants featuring different cuisines from Peruvian and French to Greek and Italian. 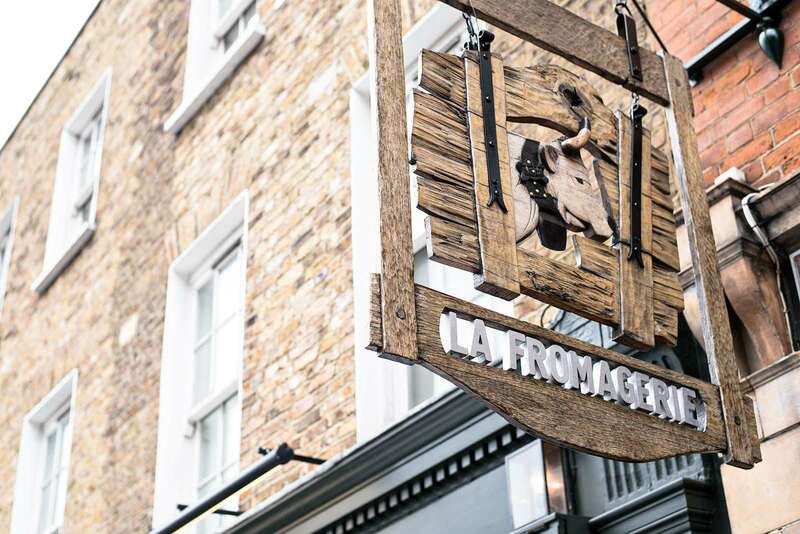 Chiltern Firehouse, housed in a former Victorian firehouse on Chiltern Street in the heart of Marylebone, offers charmingly retro interiors, attentive service and excellent food. The hotel, restaurant, bar and private club by Andre Balazs is one of London’s trendiest destinations with paparazzis parked outside most nights of the week. Forget walk-ins and instead book your table weeks in advance to secure a spot). 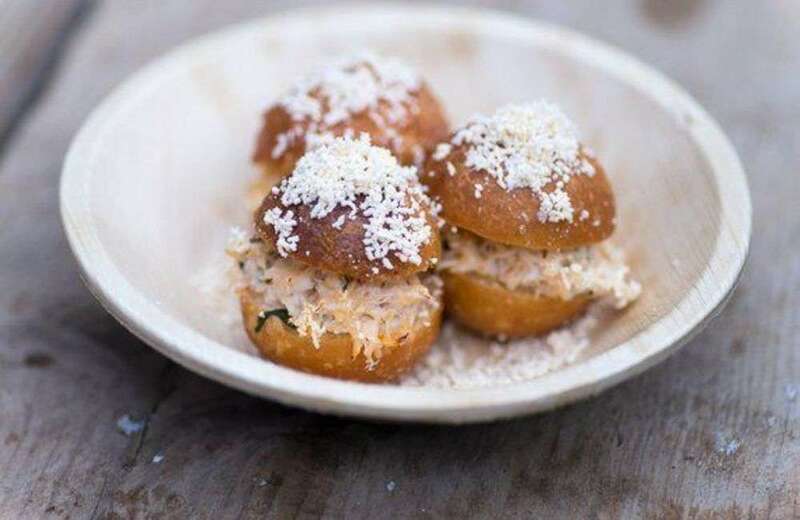 The menu, created by Head Chef Nuno Mendes, changes monthly but the most popular dishes – like the Crab Doughnuts or Frozen Apple Panna Cotta – are always available. 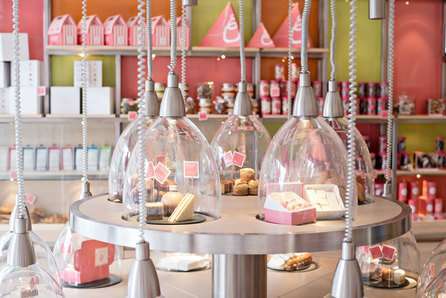 One of Paris’ best and most beautiful patisseries, LPDR took over London with this Marylebone shop which opened in 2014. 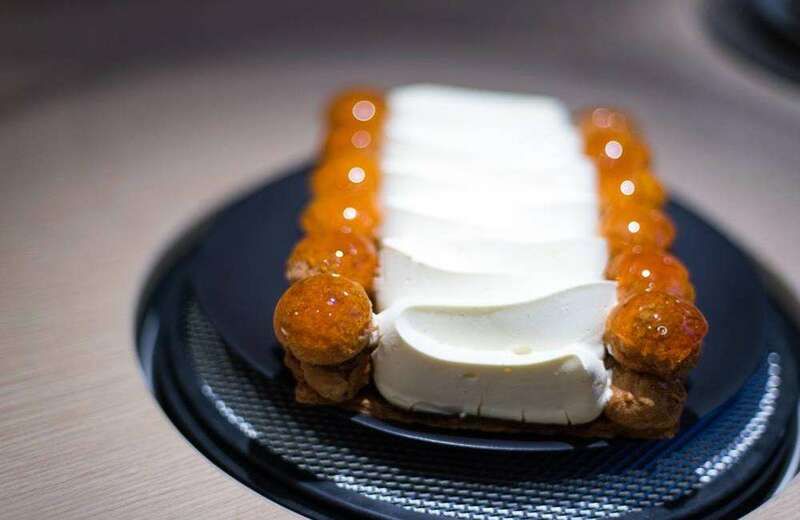 Co-founder and Pastry Chef, Philippe Conticini, is considered an icon in contemporary French and international fine cuisine. At La Pâtisserie des Rêves you will find traditional French classics, such as Eclairs, Paris-Brest, Tarte Tatin, Mille-Feuille and St Honore – the best in London. 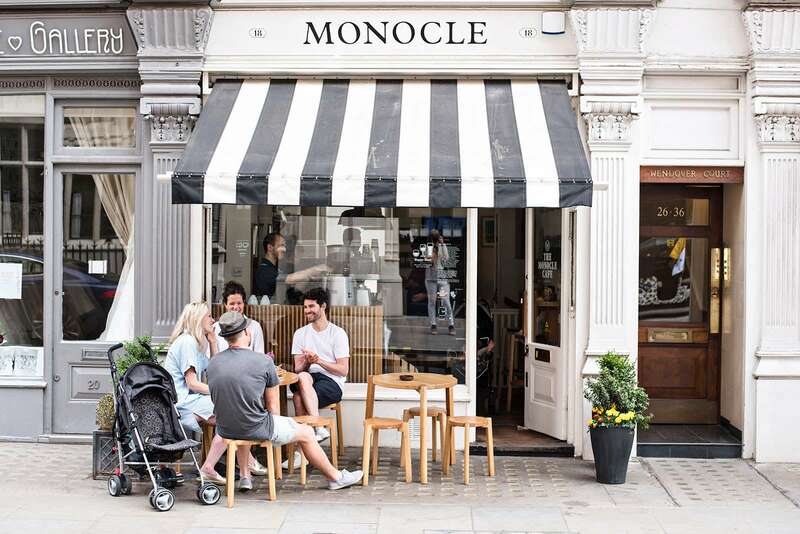 Monocle is an international lifestyle magazine, headquartered in London and focused on global affairs, business, culture and design. 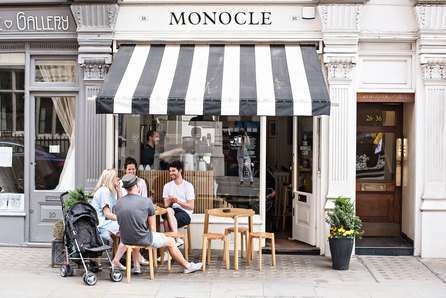 Aside from the publication and a radio show, Monocle have shops in New York, London, Toronto, Tokyo and Hong Kong, as well as cafés in Tokyo and London. 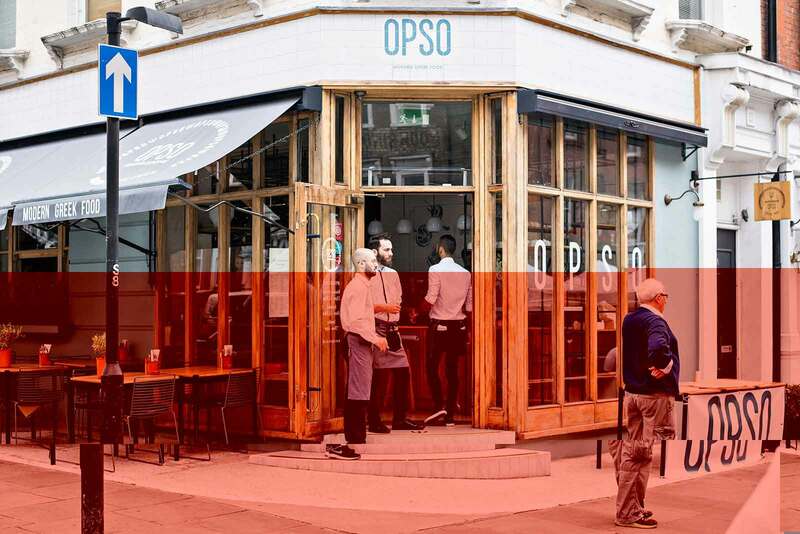 At the Marylebone’s coffee shop (located across the street from Chiltern Firehouse) the espressos are made on La Marzocco machine with coffee beans from Allpress Roastery. 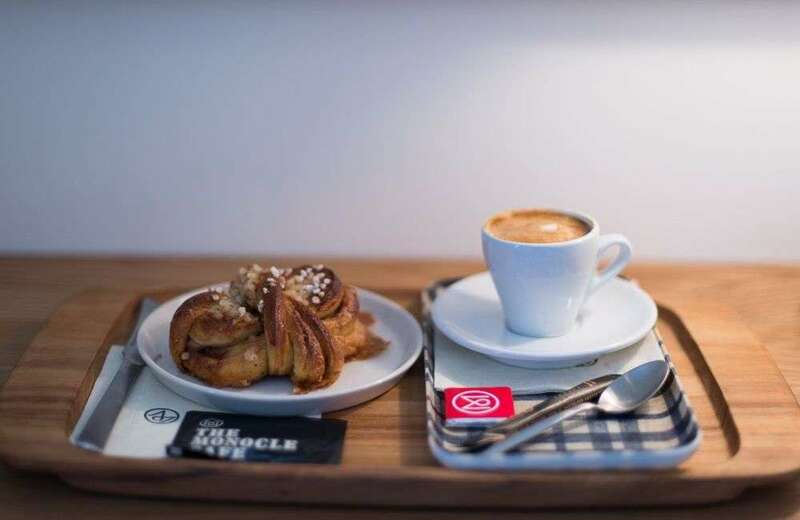 Small lunch options are available, as well as Japanese cakes and Swedish pastries (from Fabrique Bakery). Pachamama is a goddess revered by the indigenous people of the Andes. In London it’s a trendy restaurant and bar located in a basement, just off of Marylebone High Street. 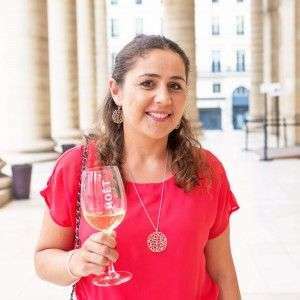 It features “dishes that reflect the spectrum of influences in Peruvian cuisine using the finest seasonal British produce” with a menu divided into “Sea, Land and Soil”. The dishes are designed to be shared by two people, the flavours are intense and the presentation is beautiful like a work of art. 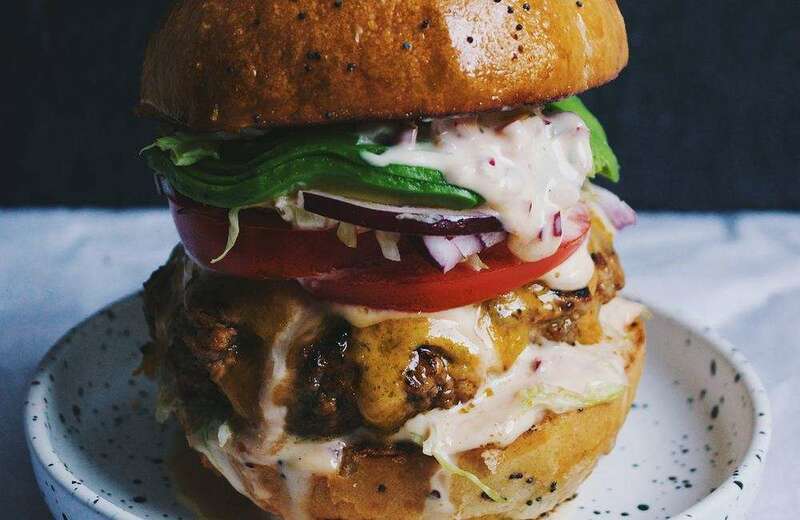 The recently launched brunch menu features a Peruvian classic, Pan con Chicharrón: a burger made with 17yo Galician beef Served on a cream bun with Saddleback bacon chicharron, smoked Cornish cheddar, aji rocoto ketchup and aji amarillo mustard. 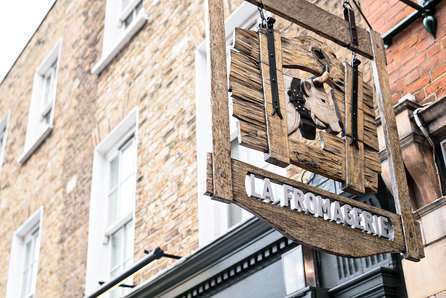 From a country which banned McDonald’s – Iceland – comes Tommi’s Burger, a burger chain with two London branches offering superb burgers and steak sandwiches prepared with the best quality ingredients. There is a tray with relish and sauces and a special burger of the month (recently the Pan Asian burger featured Pork Belly, Grilled Chinese Cabbage, Japanese Mayo and Sriracha Sauce). 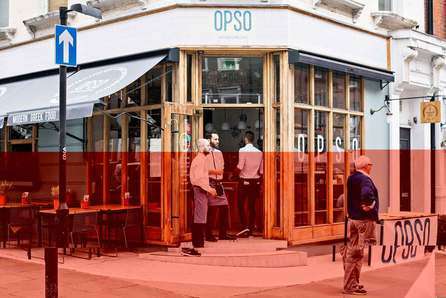 The ambience is casual and back-to-basics, and the focus is on the food – you can expect the best from Tommi’s Burger! 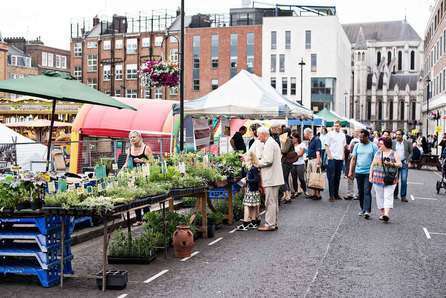 Like the look of Marylebone? Office space in Marylebone can be found in Marylebone station itself with access directly from the stations platform. 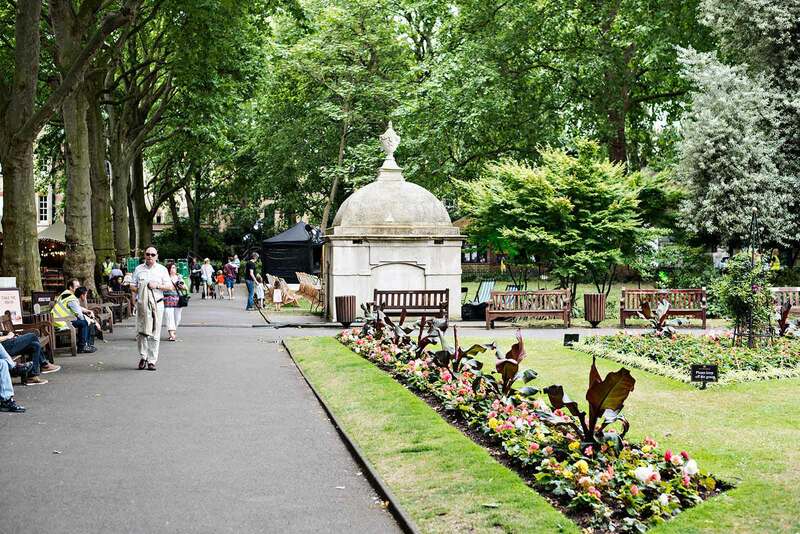 Cavendish Square offers serviced offices within a listed stucco building or a 1960’s high rise tower.